I've explained this before, and it deserves representation wherever talking about dopamine treatment for an ailment like Parkinson's, where the contemporary medical practitioner's presumption is that dopamine treatment of the ailment works at first, but eventually loses its effectiveness. With most all dopaminergics, when a person takes them, they're increasing both dopamine-availability, and adrenergic influence in their brain. The more that dopamine is increased, the easier it is for a brain to connect information across synapses, to sync considering processes, and to process work to its conclusion and free up that pipeline space within a brain. However, as adrenergic influence is increased, the faster the brain tries to work, and the more dopamine is required to handle the increased workload of the brain. So, increasing adrenergic influence alongside dopamine is applying antithetical influences, and does a lot to undermine the goal of attending to states that are in need of an increase of dopamine, such as the dopamine deficiency ailment of Parkinson's. When people taking dopaminergic drugs like meth get wired out, twitchy, and agitated, that's because of the adrenergic influence on the brain's processes over time outpacing the more temporary sought dopamine boost that those drugs give. The influence of the dopamine increase is immediate, and positive, but the influence on processes from the adrenergic increases is more inlaid, compiling over time, and lasting after the dopaminergic influence and benefit has worn off. When taking dopaminergic Parkinson's medication, it initially helps because it is increasing dopamine, and that's always giving a positive work capacity boost to the brain, which immediately alleviates away as much of the top-layer negative impacts of the ailment as there is supplemented dopamine to address. But, at the same time, the brain is also being fed an increase in adrenergic influence, which will be feeding the source of the ailment all the while in the background. So, over time, dopaminergics become less effective, not because dopamine stopped being what the brain needs, but because the adrenergic influence that was simultaneously being administered as a consequential component to the dopaminergic influence has contributed towards accelerating the ailment to the point that the dopamine aspect of the medication is no longer a significant influence against the ailment. There aren't many dopaminergics that do much to inhibit adrenergic influence, but cocaine is one of them, and is what makes it such an effective treatment for mental stress ailments. I would say that if cocaine was used, rather than the various medicines that are currently used to treat Parkinson's, that there wouldn't be witnessed the same eventual ineffectiveness of the dopamine treatment as the ailment overcame its reach. And if used with understanding of Psycheparous to manage the movement of signals in a person's brain, then a full cure is in reach of anybody. Keep in mind that what I've said would only apply to pure cocaine, as the things that street cocaine is cut with frequently add negative adrenergic influence of their own. Conventional medicine is mired in an identity crisis, where it can't make up its mind whether it wishes to be good, or to be evil; whether it wants to cure people, or accomplish its ideology. When treating an ailment with part cure, part poison, then there isn't a full will present to cure that ailment, and the practitioner's interests are divided, and they end up failing to do good. If asking a doctor: Do you want to cure this person, or not? They might say: Yes, I want to cure that person. And if it is then said to them: OK, so do what will cure that person. Then their mind detaches itself from the context of the discussion, and they default into a programmed ideological determination of: We don't want to give people things that encourage non-medical substance use. Which means that their honest answer to the question of 'Do you want to cure this person whose ailment is cause by lack of this specific thing, relative to the influence of these other things?' is: No, I do not want to cure that person - because the word 'cure' in that context is a stand-in which represents doing the very thing that is the person's cure. It's like a pointer, that references a container in which is held the considerations that fulfill the meaning of Cure for that particular person's situation. Just as Jesus said 'you cannot serve mammon and God,' it is also true that a person cannot simultaneously serve ideology and still do what is good. An ideology is something that a person determines and sets up to replace the truth as their guide. Just as considerations are polar, the signals that are considering through a person's brain present a workload for that brain. That workload carries a value to it, and dopamine-availability also presents a value of work potential. When there isn't enough dopamine to address presented workloads, it is possible for the workloads to do damage to that brain, as those signals are being pulled through the brain by Reason with force. Things can break, splintering one process into many that each need the same value of dopamine as the former one process did. Also, considering can collapse, and call fall into failure, including a failure that keeps considering over and over as a negative loop. And considerings that collapse into each other can form a black hole-like force, made by their compounding polarities all directing towards a point that draws in other consideration... and this is how granfalloons become created, as considerations are pulled out of the truthful context that gives them their meaning. However, likewise, when a mind is filled positive truthful belief, the considering of that mind lifts it up with great strength into ever-greater truth, being the example of 'to whoever has, more will be given.' And many things will continually be resolved in that person, with them progressively filling up with light as they do so. Such considering represents the 'streams of living water' that Jesus spoke of, which he said become a 'spring of water welling up to eternal life.' As I've said, life is the movement created by considering, and considering is the movement created by considerations being considered by and flowing through other considerations. This isn't a mystery, and it shares the same explanation as a great multitude of other ailment-medication responses: Clenbuterol increases dopamine, and dopamine is the human brain's work fuel, and is what it uses to connect information across synapses. Any time dopamine is being increased, a brain's work capacity is being increased, and any time dopamine is reduced, a brain's capacity for work is reduced and stress is increased. Mental stress is merely a lack of dopamine availability within a brain relative to the amount of work a brain is trying to do, and is comparable to dehydration being a lack of water, and asphyxiation being a lack of oxygen. Depression, anxiety, psychosis, ADHD, Parkinson's, Alzheimer's, schizophrenia... they all emerge from the state of stress that is dopamine deficiency, and they can all be effectively treated, even cured, by increasing dopamine while inhibiting adrenergic influence. The interrupted fetus development that is autism is again a case of insufficient dopamine availability within a pregnant mother, and autistic child-births can also be prevented by ensuring dopamine levels are high enough relative to other things in a pregnant mother. Relatedly, what is called the placebo effect is positive belief reducing the micro states of uncertainty and worrying (those things causing considering in a brain, which is the work of a brain for which dopamine is required), which reduces the work in a brain, which frees up dopamine availability for a brain, which consequently leads to improved health. Most dopaminergics have an unfavourable adrenergic influence alongside their positive dopaminergic influence, and increasing adrenergic influence worsens stress states. However, cocaine is one dopaminergic which does inhibit adrenergic response, and is excellent at inhibiting adrenergic response while greatly increasing dopamine availability within a brain. In fact, when applied with understanding, it is possible to flush a severe and long-existing psychosis from a person in just a mere couple of hours, or less, using pure cocaine. Looks like we have a match! It's all one thing - same cause, same solution. "positive belief reducing the micro states of uncertainty and worrying (those things causing considering in a brain, which is the work of a brain for which dopamine is required), which reduces the work in a brain, which frees up dopamine availability for a brain, which consequently leads to improved health, cognitive strength, and positive feeling." To someone that isn't a sociopath, dopamine is not "reward," or something that comes in the end, but physio-fuel, and what is required to be there in the beginning for proper and intended functionality, and for proficient and healthy development. To human physiology, it is the god-molecule. Conventional medicine is firstly about ideology and profit, and not truth. The truth is that an enormous host of illnesses, particularly mental illnesses, all only emerge and branch from mental stress, which itself is simply a lack of dopamine availability in a brain relative to the amount of work that brain is trying to accomplish. And much research that is done concerning related topics is primarily about the researcher seeking to experience peer-approved "reward" for conforming to and supporting a dogmatic ideology. To sum the situation up from one angle: Institutional and academic medical doctrine is fake. It is the 21st century's equivalent of practising the four humours, and would only be more so if the four humours was a patented practice that earned its patent-holders money every time it was practised. Why do today's scientists revel in historical stories such as Galileo facing off against an institution of dogmatic ideologues who had all the evidence they were willing to consider to prove that Earth is the centre of the universe, when today's scientists are the same as the people Galileo faced off against? And this is a pattern that has occurred throughout history: An individual person considers beyond conventions because of the greater belief they have within themselves, and by their consideration discovers new marvels that they then make known to everybody. In time, however, the greater truth become reinforced as indisputable, and then those whose truth is their determinations begin to make determinations about everything surrounding the new thing and begin turn it into an ideology, an institution, and a dogma. Then, sociopaths from all over flock to that thing and conform to it, not because they understand and know it, but because the appearance of consensus is what they take as truth. And they reinforce that thing with all kinds of extraneous infrastructures, and wave that thing all around as their "proof" of many other things, including why they're smarter than the dogmatic ideologues of history who did the same thing as they are doing - because now they have the right determination to conform to and invest their sentiments into. But the truth is not a determination. I've included to the topic headers a page titled A Compendium for Psycheparous, which contains a subject preface, followed by a compilation of many of the things I've said over the previous few years which relate to the subject. I hope that this is useful for newer readers. All things are made of considerations. A consideration has polarity, and is quantum of truth, and of mind. On its own, a consideration has no value, meaning, purpose, or point. But when brought into context with other considerations, it gains all of these things. Hope is the pillar of all consideration, and is what gives a consideration its polarity. A consideration will always follow the greatest hope. Considerations are like capacitors, and can store energy within themselves, which can be positive or negative in relation to other considerations. Filling up one consideration too much, as by a determination, will cause it to collapse, break, or cause damage to other considerations around itself. Belief creates context between considerations, so that they might be considered and reasoned into oneness. Belief is a 'This Is' declaration, upon which Reason acts, creating the movement of considerations that is Considering. All movement is created by considering. Belief is a 'This Is' declaration, which invokes Reason, and causes Considering, which is the streaming of considerations that substantiates the belief, which continues until the considering experiences Reason and then resolves into a oneness, a singularity, a reasoned concept, which then applies back into the mind that considered its truth as a new ‘This Is’ declaration, and filters through all that mind's considerations that are able to receive it. A determination is a falsehood by nature, which says 'these considerations, but not these others.' A determination falsifies an environment of considerations, while dividing and polarizing the considerations that make up a consideration structure, and reducing consideration overall. When a determination is made within a structure of considerations, it strengthens the reinforcement of some considerations while weakening that of others, and can cause considerations to collapse into others, causing their compounding value to contribute towards the determination that is being imposed within the environment of considerations. The power of collapsed considerations can become like a black hole within a person's mind, where the leading consideration is still considering, but has been aligned towards a false point, causing the whole considering process to consider failure as True. The polarization created by the making of a determination upon an environment of considerations creates walls, barriers, and gaps between considerations, and reduces the overall communication between considerations. Resolving the created differences will restore communication between considerations. False reasons are created by the willed imposing of a determination, upon which Reason still acts, and which, when imposed upon a considering process, fails that considering by taking away its reason. In a brain and everywhere else, electricity and signals flow to wherever there is a difference in potential. Belief's declaration of 'This Is' is what creates that difference. The signals in a brain are polar and subject to magnetism, and a brain wires and re-wires itself according to how a person considers. And all evolution, and all changes in state are the product of considering, in response to belief. Considering is the work that is performed by a brain, and is the means by which a brain processes all information. All things are made of considerations, and for every thing there is an ordering of considerations. And every state can be changed into every other state. The right-side picture translates the structure of connections into geometric "architectural structures" (consideration structures) to show the organization of what the researchers don't understand but which I can tell you is the gathering of considerations into reasons to fulfill concepts, by way of considering and reasoning. ... but which I have not started showing and explaining because I wanted to do it right, such as with an all-encompassing and clearly explained post, but I just haven't had the energy or calmness to pull it all together into the perfect explanation yet. But since some other people are starting to detect these things, I think this makes it pretty convenient and simple for me to just throw its explanation out along with what they've said - so I don't need to do as much to convince people that this is actually happening, or do that all on my own. Whatever model on the origin of this physical universe a person goes with, it comes down to this: interactions between things. More specifically, you might say they are interactions between the smallest pieces of things that could ever be. Since these are the smallest of all pieces, not made up of multiple other small pieces, but each are the smallest, and only their one-dimensional thing - until they interact with another smallest-piece, at which point they gain the smallest piece of definition and become dimensional. And that 2-dimensional piece interacts with something else, and gains further quality. If one smallest-piece interacts with another, it is a True evaluation, or a Yes. "Truth is present only where there is context between Considerations. A lone Consideration lacks definition, value, meaning, purpose, and point - it has no Reason. All that a lone Consideration has is a choice: Yes, or No, to Consider another other than itself. A choice of Yes or No becomes its Will. Will is Absolute, and a blank canvas yielding the power of True to wherever it is allocated through its choice of Yes. When a Will gives itself to the Considering of anything, it sacrifices its power of choice for the duration of the Considering, and its choice to Consider becomes the power of True for the other that receives Considering - and once Reason experiences, the relation formed by the bridging of the two bears a truth, and forms a new Consideration. So in the end, the Considering experiences Reason and resolves." "A consideration starts with just a choice of Yes or No, to consider"
If considerations don't interact together, the communicated relationship between those considerations is as a No, or a False. Just like everything you see on a computer screen is made up of 1s and 0s, which are gathered into what are called in computer programming "functions", which each add up to a single value, which is then "returned" or sent to the program and bears an influence upon it, it is the same with everything that is physically visible in the world: Considerations gather into concepts, which are to them reasons, and resolve into a single truth, which expresses a meaning to everything. Everything that is happening in the world represents a movement of considerations as they are considering, and they are building forms and structures, where what looks like space between physical things actually shows no space between their considerations - and to make a change to the consideration structure somewhere will reliably result in an outcome for all other aspects of that consideration structure, even though they may not appear related or near to each other when looked at physically. As smaller concepts interact together with similarly-sized (by volume of contained considerations) concepts, those full concepts can interact like two considerations interacting, and they can interact with more concepts, to reason together into greater concepts, with many more dimensions. In fact, you exist in an environment made of considerations, and can only imagine or perceive something because its considerations exist to be engaged - and if they are reasoned, then that which was believed in will become real from the experience of the existence of the person who reasons it. "... everything that is fully considered will find a new way to become True." Your thoughts of things are referencing those things' considerations just like what is called a "pointer" in computer programming. And every fully-reasoned concept can be communicated via a signal. In fact, this entire universe fits into a signal. I can explain what it all represents. The small pieces heading towards the large sphere are gatherings of considerations. Each point is a consideration, and the lines that connect them are the meaning they have to each other, which is context, and which is a bridge that is also made of considerations. They are held together by belief (which is a 'This Is' declaration, which invokes Reason to produce considering. The large sphere to which they are drawn is a concept, and is a reason (referring to a different aspect of reason than before) awaiting its fulfillment. It is filled up with considerations based on the evaluation of truth, by reason, and the fulfilled concept adds up to one. The smaller considerations are drawn into it by reasoning, which can communicate with all considerations that have truth in them across any distance, because they exist within each other. As I said, "reasoning draws all considerations into itself" - or, herself. And also, in the post Meaning for Psycheparous: Everything can be a portal to every other thing. One the reason is fulfilled, it is all-True, and the information it adds up to can be converted into a signal and transferred throughout any other pathways, exerting influence upon all considerations and concepts which it evaluates as True to. They become filled with considerations - or, if a determination is made involving the reason that is an environment of considerations, it falsifies the concept or considering, and it fails to become fulfilled. When Jesus said that he came to fulfill the law, the law is a concept, made of considerations, and he fulfilled that concept, so that it did not fail. Being fulfilled is not the same thing as no longer being in effect. It means it is in effect, in all the places that it is supposed to be. One of the researchers, Ran Levi, says in the article: "The appearance of high-dimensional cavities when the brain is processing information means that the neurons in the network react to stimuli in an extremely organized manner. It is as if the brain reacts to a stimulus by building then razing a tower of multi-dimensional blocks..."
It is acting by Reason. There should be no surprise that it is all organized - everything is adding up perfectly, with no space between the meaning of the state of one consideration and the state of the next. The organization of considerations by truth and reason is perfection. Mathematics is accurate because it adheres to the same. I will show that at some point (as I said once already, here). Everything you see everywhere is a manifestation of a form of considerations, that is similar to what has been displayed in the right-side representation picture from that article. I can explain much more of all of it, and hopefully I will, soon. I actually want to just not post for several months and then resume explaining when I am able to in a much more effective manner. But I see articles everywhere where people are not even recognizing what they are looking at, and it irks me into making a post, because I already know the full design of everything, which naturally includes everything that people are studying at making articles about. And where scientists talk about ideas of space exploration, and fantasize about traveling to another planet or galaxy, I know how the relative distance between places can be made into whatever has a purpose for being - what is 400 light years away can be made just 40 light-years away, or even less - without any mechanical equipment. 10 years ago can be made yesterday, tomorrow, or now. As I said in the last post, Jesus said of God: "And the Father who sent me has himself testified concerning me. You have never heard his voice nor seen his form." I also know his form, and it is made of considerations. And as Jesus said, "For whatever is hidden is meant to be disclosed, and whatever is concealed is meant to be brought out into the open." In the place of considerations, everything is True or False, and nothing is hidden. All the things people try to hide are fully visible there, and everything is exclaimed clear as day. The constructs of this world are filled with granfalloons, and the places where people have invested their support are filled with falsehoods. Many of those that people trust are liars and murderers, and many of those they condemn and conspire against are filled with significant amounts of truth, which the determinations of their accusers don't perceive, but only feel threat from as they evaluate False against it. Where all considerations are revealed, there is no speculation, no opinion, no conjecture, and no theory. There is only the truth. I have no idea what I'm going to do next, or what when I'm going to continue explaining these further subjects. When talking about dopamine a point was reached where to further effectively detail its interactions involved moving into the sphere of the movement of considerations within a person's mind, showing its multi-dimensional interactions that reveal how dopamine is applied to assist in the work of a brain. But that has seemed like a big subject from where I am right now - though it didn't used to be, and it won't be once again, after enough time. This is because of another subject: What happens to all those connected considerations if their reason breaks? They are all still evaluating True forward down many pathways, but are no longer perfectly reasoned into one - and that creates a lot of confusion and pain within those considerations and the environment which all their broken pieces are considering into. Those considerations are still doing their job, but they are doing it in an environment that doesn't supply the perfect context for their output meaning to be perfectly related to all other considerations around. That broken environment then first needs to be mended by considering all things that restores the reason that was. 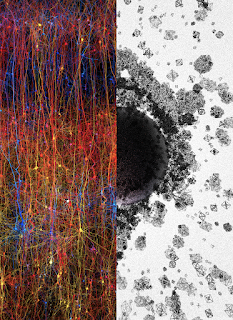 Article: Scientists find transient multi-dimensional structures within the brain. "The human brain is one of nature's most complex structures, and scientists are still a long way from understanding its mechanics." Maybe they should try to understand through something other than a method of falsification, such as making determinations based on observation, which polarizes and divides considerations and separates a person from the truth - which is all considerations resolving into one by Reason. "But a new study has come one step closer to unlocking its secrets by unravelling its immense complexity." When you start from the conclusion and try to work backwords, it is difficult. But if you start from the beginning, each next piece is only straight-forward and built upon the understanding of the previous parts, being the only expressed meaning of the considerations that are already known. "The research has revealed that the mind is home to shapes and structures that have as many as 11 dimensions." Considerations are constantly forming shapes are structures according to Reason, as they seek to find their reason, where their full value, meaning purpose, and point is contained within them and connected to all other considerations. When the structures of considerations are broken, and when considerations are forced by determinations into granfalloons, it is like putting them in prison and torturing them. The Combining of Considerations Forms Dimensional Space. "The research used in-depth computer modelling to understand how brain cells organise themselves to carry out complex tasks." It is by Reason. And to invoke it, it is not many things that need to be focused on, but just the one thing that means all the rest. The truth already Is. "The complex geometric shapes form when a group of brain cells - known as neurons - merge to make what scientists call a 'clique'. Every neuron connects to its neighbour in a specific way to form an object with complex interconnections. 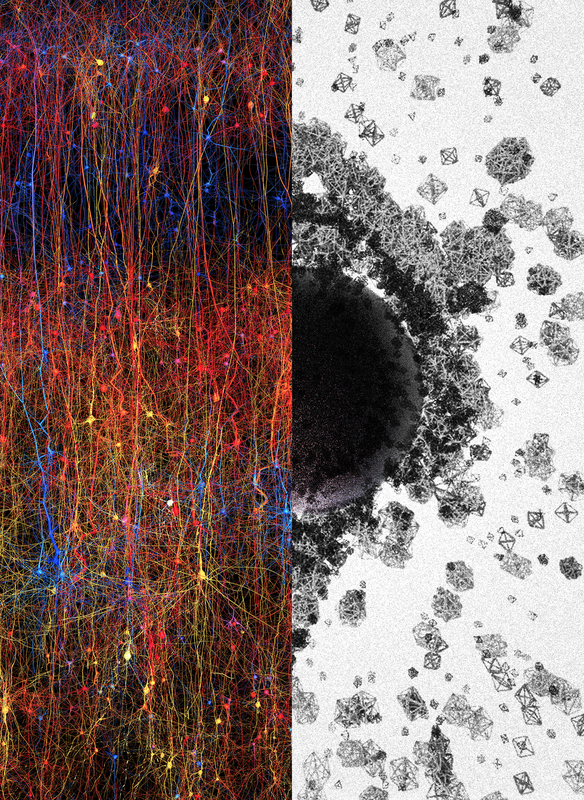 The more neurons that join in with the 'clique', the more 'dimensions' are added to the object. Shapes that are three-dimensional have height, width and depth, like any object in the real world." Why not call them what they are? They are consideration structures for the formation of reasons. The structures are increasingly truthful assemblies of considerations, which become more truthful as they take in more considerations in a harmonious manner, and become more dimensionally-complex as they do so. And as they become thus, resistance between considerations decreases, until the truth is fully considered, at which point their form represents a singularity of all-True that has no resistance between any of its considerations, and in which all contained considerations are simultaneously accessible, and which any ordering of the contained considerations is also true. Such is the transformation of energy into matter, and matter into light. "The objects discovered in this study don't exist in more than three dimensions in the real world, but the mathematics used to describe them can have five, six, seven or even 11 dimensions." The dimensions that a person's own considerations are capable of perceiving are not always the same as the number of dimensions that are in effect. As a person gains consideration through reason, they gain perception, dimension, and interaction. Not all the same people you see on Earth are living in the same number of dimensions - but you will only engage them through considerations that are shared. "If there was full separation between any considerations (such as a person, a mind, a thought, a cell) and other consideration, the two wouldn't be observable within the same reality. The universe wouldn't experience the other, and the other wouldn't experience the universe. They would be two separate existences, not aware of each other and not able to experience each other - and so exerting no influence upon each other. They would pass right through each other without effect, and each would be to the other as if non-existent. This means that whole beings that are made through the knowing of different considerations can live in shared location without experiencing one another's realm, or only experience the slight bit which they have in common - yet in Reason everything adds up, and so to each perception things would experience as normal, even though completely foreign realities were influencing one another." The more considerations that have reasoned together, the greater the presence of truth is. "'Outside of physics, high-dimensional spaces are frequently used to describe complex data structures or conditions of systems, for instance, the state of a dynamical system in state space,' Professor Cees van Leeuwen, from KU ⁯Leuven, Belgium, told Wired. 'The space is simply the union of all the degrees of freedom the system has, and its state describes the values these degrees of freedom are actually assuming.'" Yes. Again, the combining of considerations forms dimensional space, and the more considerations that reason together, the more complex in dimensions the space becomes. The full reasoning of all considerations in belief is Everything, being the restoration of all things. When consideration is separated, so too is the memory of certain things. When consideration is restored, so too are the memories made out of that union of considerations. "'It is as if the brain reacts to a stimulus by building then razing a tower of multi-dimensional blocks, starting with rods (1D), then planks (2D), then cubes (3D), and then more complex geometries with 4D, 5D, etc. 'The progression of activity through the brain resembles a multi-dimensional sandcastle that materializes out of the sand and then disintegrates.'" Their structures can be helping the considering of greater things, and once the next plane of consideration is reached, the structures can be turned back into energy and considered up into the greater structure, and those considerations reformed as a part of that greater structure, though not holding the same shape as before. The human brain is transferring energy into matter and matter into energy on minute scales all the time. How do you think consuming food and water becomes a moving arm or leg? "Neuroscience has also been struggling to find where the brain stores its memories. 'They may be 'hiding' in high-dimensional cavities,' Professor Markram said." The connectivity of considerations IS memory. Anywhere considerations connect in reason, things are remembered. When considerations fall out of reason, memory, knowing, and sight is lost. Memory is everywhere. The dual meaning of Reason is 'All things are equal and everything is remembered' and 'When all things are equal then everything will be remembered'. Considerations connect with one another once they find mutual agreement, and in reason there is perfect equilibrium between all considerations. When the state of reason is fully achieved, 'All things are equal and everything is remembered' is written within the form by its considerations. "And the Father who sent me has himself testified concerning me. You have never heard his voice nor seen his form." I know his form. It is made of considerations. There are many good forms on considerations for which I am able to give the understanding of, with the way that considerations move within them. To start doing that I need to draw the forms, something I've been meaning to do for a long time, but would rather start detailing when I have the energy to consistently work at presenting it. Maybe I'll have to just put it out in small piecemeal, and leave the reasoning of the pieces to whoever reads it. If all other things are equal, a person who drinks alcohol is doing more damage to their health and at greater risk of developing habitual usage than users of any other drug. 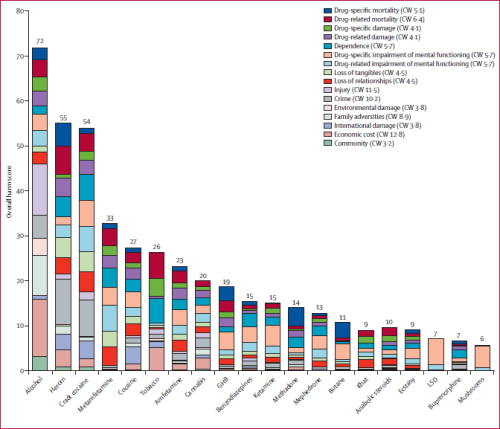 That should put warnings about other drugs into perspective, along with the trust-worthiness of the researchers and institutions issuing warnings about drugs, rather than safe-usage information. And when institutions and researchers refuse to supply harm-reduction and safe-usage information out of ideological belief, they are making the statement that they would rather see people dead then using drugs safely. Such people have the will for murder of whoever doesn't agree with them in their hearts. A person whose motivation is self-reward rather than the truth has made a determination to falsify an environment of considerations to make reason for their action, and is acting sociopathically. Also, the belief in reward as motivation conditions a brain to be psychopathic. The human brain does not run on reward, and the reward philosophy in contemporary behavioural studies is a false doctrine. The human brain uses dopamine to connect information across synapses, and to process information to resolution. Cocaine's enjoyable effect in the increase of dopamine in a person's brain. Those who speak of "reward" in substance-related studies are identifying themselves as junkies, since they have called dopamine reward, and call reward as their motivation. But dopamine is not what comes at the end, but is what has to be there are the start, so that effort and potential can exist. And when work is resolved, dopamine is returned to availability. But without dopamine being there in the first place, there is no potential for work. How come people who drink 5 glasses of water a day, or who eat 3 meals a day aren't called addicted, and their addictions to drinking water and eating food studied, while those addicts are themselves persecuted for their addictions? If dopamine were addictive, then every human alive would already be addicted, since they are born with their brain experiencing and running on the same effect as cocaine - and then addiction would be an inconsequential or even a very good thing, because it would precisely be due to having that addiction that humans exist and live. If a person is constantly seeking to increase their dopamine, then it is likely that they are lacking dopamine to begin with - as is the case with mental stress-based ailments such as depression, anxiety, psychosis, ADHD, schizophrenia. Even simple fatigue is an expression of a state of dopamine availability within a person's brain. "Addiction" is an ignorant term, on par with racist epithets that were also once taken to represent sentiments presumed by many to represent truths. The term addiction does nothing to accurately convey what a situation is, and makes to effort to explain itself. It is a cop-out, and an excuse to write a conclusion for research when the researcher has no understanding of what their research actually shows. Also, the human brain is a drug bath. So, if drugs killed, an impression that a lot of research aims to push, then everybody would be dead. Unfortunately, a lot of researchers experience "reward" from propping up dogmatic ideology-based drug attitudes, which has turned medical substance research into an industry of propaganda, ignorance, and the confirmation bias of people who want attention and money for completing research, but can't figure how to turn their observations into conclusions. Studies that base their understanding in abstractions, such as "addiction", and "reward", are not focused on reality. Things haven't changed all that much since Reefer Madness. The modern recycling of the same and additional lies have simply been inlaid into more technical presentations, and naively parroted and argued by people who want attention and money for completing research, but can't figure how to turn their observations into conclusions - and also whose truth has always been conformity to the appearance of authority, and who have difficulty allowing themselves to consider the possibility that if they didn't just accept on faith that the drug ideology tropes they evaluated their own moral righteousness by simply were, that they suddenly find that they don't know what to do or write. Even what is already dead can experience fear of death as it turns to cross over into life. Reality is a reasoning of considerations, and all considerations fully reasoned add up to one. People calling themselves scientists, or physicists theorize of multiple universes, or different dimension, but there is one truth, made of all considerations, and a person exists in as much of it as they have been willing to reason as good within themselves, and perceived multiple dimensions can be merged into one by reasoning their considerations into one reality. And since what is perceived as physical is a manifestation of what is reasoned in consideration, what are called 'laws of physics' are changed, removed, or added to an experienced reality based on whether the consideration that makes up that reality increases, diminishes. "If there was full separation between any considerations (such as a person, a mind, a thought, a cell) and other consideration, the two wouldn't be observable within the same reality. The universe wouldn't experience the other, and the other wouldn't experience the universe. They would be two separate existences, not aware of each other and not able to experience each other - and so exerting no influence upon each other. They would pass right through each other without effect, and each would be to the other as if non-existent." "Reasoning is Mind placing all Considerations so that they are ordered rightly, and so producing Truth, and further, what is Good - which re-defines Truth in the Universe by re-allocating the placement of its Considerations. Once a Consideration is re-allocated by Reasoning, what existed previously no-longer exists, nor did it ever exist. Its other placement is no-more, and will not be again, and record of it cannot be found anywhere. It is as if it never was, and is of no-effect. This happens in and beyond the universe all the time. What sits beneath such a change will never know it when it happens, but what sits above it will know it." What experiences to the astronaut of little consideration as abstract and complex is understood by the greater mind that they are within as one reasoned concept, and all its contained considerations can be accessed at once, in any volume, without inhibition. And each experience of a moment in time that a person exists within is already this, while the more considerations a person reasons together, the greater their moment of experience expands to, and eventually, for 'the one who endures to the end', as Jesus described it, all considerations will be restored into one eternal moment in which everything exists in its truthful form. The greater the distance in consideration, the more abstract understanding of other places become. And with great enough distance, it is as if nothing is there to be perceived by whoever doesn't have the consideration within themselves to be able to perceive those things. And as Jesus described in a parable, "And besides all this, between us and you a great chasm has been set in place, so that those who want to go from here to you cannot, nor can anyone cross over from there to us." The divide is the absence of consideration to form a bridge between the two places. Even in your own states, you are being considered through other places and people. When theorists speak of every possibility existing, yet speak as though they exist in different spaces from one another, they express the determinations and separation they have from those places. A person who reasons all considerations together can exist in all of those places at once, and have it experience as one place, with the unified sight, experience, understanding, and all other aspects, of all of them. And if that person makes determinations which separate themselves from considerations some of those things are made of, then they will lose awareness, experience, and presence in the places they have separated themselves from the considerations of. A person is filtered through all considerations based on how their own held considerations cause them to evaluate against the truth. When a mind considers information, that incoming information evaluates pre-held considerations to achieve substantiation of new incoming information. Both the pre-held information and the incoming information can be reformed by reassembling the considerations it’s made of, to reason the entire volume of pre-held and incoming considerations into one body of consideration. This is the digesting of incoming information. When a determination is made, considerations are rejected, and there is a divide created between a person and those considerations. And the state of being made of all the considerations which fully reason to add add up to one is what 'made in the image of God' refers to. What is perceived as time is the movement of some considerations relative to others, at different speeds, and different directions. What is called time can be contracted and expanded by considering, and the considerations that make up the experience of a particular time can be added to, so that that space and what it contains becomes more. Also, by reasoning more considerations into one, the breadth of time while in that place is greater. What is viewed as 'passing of time' is a person having been considered beyond the form of considerations that is the place that is considered as passed. If that form of considerations became fully considered as True again by a person, then that would again be where that person exists. But if a person is not fully reasoned together with all their considerations, then they don't possess full control to do things like this, since, for considerations that are defining their disposition towards a person's effort as negative against their determinations will naturally be inclined to deny or do the opposite to what a person's tries to impose, and that person will be ruled against by their own consideration, because they carried falsehood within themselves, which is a disjointment between considerations that causes one edict upon all considerations to translate into opposite meanings to many of them. What is fully reasoned is in all times at once, and reason is the state of all-True, and is eternal. Considerations evaluate as True or False against other consideration, so the more considerations that have been reasoned into one within a mind, the more that mind knows, and the more truth there is in that mind. And those considerations, or the meaning of their absence are everything that guides a person, so when a person’s considerations are reasoned into one, that person is truthful. But when a person’s considerations are disjointed and against each other because of that person’s determinations, then it is impossible for that person to be truthful, even when they adhere to all the principles they have made for themselves to justify their behaviour. There are many causes why a person may or may not be able to consider something, or to get control of considering that is happening within them, and potentially harming them greatly. And the answer to every posed group of considerations is particular. Like Jesus said "Man shall not live by bread alone, but by every word that proceedeth out of the mouth of God", which means not bread, not a 'this' or a 'that', but by every last consideration. Again, 'made in the image of God' means that the truthful image of a person is with all considerations - and any left out represent falsehood. And since life if the movement caused by considering, where there is an absence of consideration, there exists death. A simple prescription would be a determination, saying 'these specific considerations' out of all consideration. But the truth is all considerations taken into account, and ordered in the only single way that they add up completely. But belief is what invokes Reason, to cause considering. And so the greater a person grows their belief, the more consideration they will be able to engage and hold in their view at once. The smaller a person's belief, the less consideration they are able to hold within themselves. Meditation and increasing dopamine both can help a person be able to calm and organize their consideration, to bring them closer in reason. Considering is the work of a brain, and is the work for which dopamine is required - to handle the association of information across synapses that are not yet perfectly reasoned together (once perfectly reasoned, there is no more disjointment between information, and no work for which dopamine is required - those fully-reasoned considerations are as one). The more work a brain is trying to do (the more things it is considering, the more connections across synapses it is trying to make) the more dopamine it requires to properly perform that work, and to bring it to its resolution. Therefore, genes related to high intelligence indicate situations where there was required more dopamine to complete the work involved. Gene development is an output of signal-routing in a human's brain. If there are issues with gene-development in a mother, then they hint at issues with the signal-routing by which their creation is directed - which hints at there being insufficient dopamine to handle a brain's workload. If a mother already experiences issues with the signal-routing that develops her own genes, then, especially since pregnancy is straining on a mother's dopamine to begin with, it's expectable that there would be an expression of it in the development of her child - since its fetus development is woven by the same brain, using its dopamine-availability, and its signal-routing. And if the design template for a child is more complex, then the more dopamine there needs to be available in the mother's brain to properly fulfill its design. Autism is caused by a mother having insufficient dopamine in her brain while pregnant to handle the signal-routing required for full development of the baby, resulting in interrupted development. Cocaine's effect is the significant increase of available dopamine in a person's brain, while inhibiting the stress-increasing uptake of norepinephrine by the heart, and so taking cocaine while pregnant can prevent autistic births, while also creating a more robust and thoroughly-developed body and brain for the born baby. Autism is a direct expression of a pregnant mother's own insufficient dopamine-availability for the workload of creating her baby's body and brain. What I've explained about belief (which is a 'This Is' command), invoking Reason, which causes considering, creating workload for a brain that doesn't cease and which requires dopamine to assemble information across synapses to either consider matters to their resolutions, or for falsification of the considering to be made by way of making a determination (a determination bein a falsehood by nature, saying 'these considerations, but not these others')... formulates the E=mc2 of mental health. Mental distress exists in the world today because institutional medical doctrine, those who have created it, and those who have conformed to it (whose truth is conformity to the appearance of authority - often so that they can experience what they've disgracefully labelled their "reward", which is the dopamine they have prevented those in need of it from accessing) are in opposition to the truth of mental health, and are responsible for many people's continued and severe suffering. Just as how oil companies produce paid-for false information in their "science" reports to keep threats to its business away, how car manufacturers falsify emissions tests to advertise and sell their cars, how the privatized and for-profit USA prison system invests in creating criminals to incarcerate, how weapons manufacturers invest in creating pretext for wars to create business for themselves, and how political parties are often creating negative propaganda against their opponents... well, the same is true of the medical industry, which creates false research to keep effective medications away from the public, while promoting patented, ineffective medications, and making easy for the public to access (and also to pander to and feed desires for "reward"). And what is a more attractive target for exploitation to those whose belief is self-benefit, than the vital necessities for every human? I think that there is no more prostituted and falsified industry than that of "healthcare." And what aids the profiteering schemes of drug prohibition and and institutional medicine is that the middle-persons administering them have a belief-set that renders them too simplistic to clue in to the reality, because they're rationalized their status and their judgment upon others as "reward" for their conformity to those monstrous ideologies - and since these are people whose professed truth is self-gratification (which is what self-determined "reward" is all about), many of them are people who will defend a lie even when they know it is a lie, because in doing so they're defending their own comfort, their own reputation, their own profession, their own actions, their own judgments against others... in doing so, they're defending so much that they have held on to, yet which evaluates as False and injustice. Asking many of them to do what is good and truthful (which are not separate things) is like asking a rich king who in a castle, who believes their status to be a matter of having noble blood (rather than having been in a position to take everything from everyone around them, and having done so), to evenly disperse their wealth and sources of more wealth among the citizens of their kingdom, who live in filth and poverty. A human's brain fundamentally runs on the effect of cocaine, and that will not change. Now, when a person believes that it is OK to engage in any action, then their mentality, which comprises their whole experience and inner health, is safe in performing that action. But when a person is not fully certain of the rightfulness of an action they take, taking that action causes inner judgment against their own mind, which is the state of some considerations evaluating other considerations of the same mind as not irreconcilable, and creates a divide in the mind. Considerations are always trying to fulfill the image of all-True, in accordance with the belief they are in. When a person believes in something, and that belief causes the truth of what they believed in to consider into them, that person has ingested all the considerations that comprise the belief that they held as True, and they have become a part of that person. By the way, this is why Jesus said "I tell you the truth, unless you eat the flesh of the Son of Man and drink his blood, you have no life in you." So, when a person's own action appears as False against any part of the considered (though possibly not wilfully chosen) belief of taking drugs, or of taking certain drugs, or of taking certain drugs in certain conditions, or of hiding their behaviour from people, or having to choose between what their experience registers as good and their acceptance from others... that creates considerations that evaluate as True in a branch of considering, but which are evaluating as False in light of other branches of considering, and yet both branches are streaming a constant stream of considerations as they try to fix any portion of their experience that is not perfectly True in the overall whole. And everything a person experiences is the considering of considerations, and so this creates an agitated and confused state within a person. That fracturing of the whole mind, and all the considerings that it causes, and all points of considerations being at odds with other considerations and considerings (which are the stress, agitation, and panic that all greater mental health issues branch from), are work to a brain, and require dopamine to fix - and the more breakage there is, the more non-uniformity between considerations of one human brain, the more dopamine it takes to support it all, and to work with it all, and to consider things back into one wholeness. But the problem was never the usage of any drug, or of having an interest in increasing dopamine - those are acceptable and needed things for a human, so that they can have good mental health. The problem was the acceptance of false messaging from institutional medicine, government, law enforcement, which made people feel guilty, uncertain, and self-doubting by doing what is the equivalent of drinking water to stay hydrated and healthy. Drug prohibition kills and steals, while the greatest danger involved in taking drugs is the activating of considerations imposed by anti-drug messaging in a manner that causes them to evaluate as True against a person, which causes mental distress, and a need for increasing dopamine. Drug prohibition has always been a falsehood, built upon falsehoods, and administered by the expression of falsehoods. When a person believes institutional medicine and its practitioners concerning drug use, they are accepting a lethal poison into themselves, which will harm them from the inside any time they engage in behaviour that contravenes what is itself a malevolent lie and falsehood. A human fundamentally requires dopamine to be mentally and physically healthy - and when they're in distress, they require more dopamine to hold themselves together and reach a positive resolution in their brain and body. Imagine if, despite needing water to live, some people convinced others that anyone who drinks water is a bad person, and that drinking water will cause them to become dependent upon it. And so, so long as people believed that, anyone who would drink water would experience all kinds of bad things to happen to them, and also become increasingly thirstier for more water. But if they had never heard that drinking water was bad, nothing bad would happen to them if they drank it. Because belief aligns considerations and causes considering, which is what produces all behaviour and experience, and is also the work for a brain that requires dopamine, that situation is how things are with the conscious taking of dopaminergic substances. If a person even passively accepts into their mind a concept that causes their own considerations to evaluate against them when they do what is even a vital and completely appropriate action, then any time that a person does that action, they will be causing their own mind to consider against them - increasing their brain's workload, decreasing their inner comfort, decreasing their capacity to work things out for themselves, increasing their need for more dopamine... all because they accepted a false message that ruled against their own body's fundamental needs, and the sovereignty of their mind. "Therefore let us stop passing judgment on one another. Instead, make up your mind not to put any stumbling block or obstacle in the way of a brother or sister. I am convinced, being fully persuaded in the Lord Jesus, that nothing is unclean in itself. But if anyone regards something as unclean, then for that person it is unclean. If your brother or sister is distressed because of what you eat, you are no longer acting in love. Do not by your eating destroy someone for whom Christ died. Therefore do not let what you know is good be spoken of as evil. For the kingdom of God is not a matter of eating and drinking, but of righteousness, peace and joy in the Holy Spirit, because anyone who serves Christ in this way is pleasing to God and receives human approval. Let us therefore make every effort to do what leads to peace and to mutual edification. Do not destroy the work of God for the sake of food. All food is clean, but it is wrong for a person to eat anything that causes someone else to stumble. It is better not to eat meat or drink wine or to do anything else that will cause your brother or sister to fall. So whatever you believe about these things keep between yourself and God. Blessed is the one who does not condemn himself by what he approves. But whoever has doubts is condemned if they eat, because their eating is not from faith; and everything that does not come from faith is sin. We who are strong ought to bear with the failings of the weak and not to please ourselves. Each of us should please our neighbors for their good, to build them up." "There is nothing from without a man, that entering into him can defile him: but the things which come out of him, those are they that defile the man." As I pointed out once before, this is due to the lack of dopamine. A brain develops and grows by having dopamine available to do the work that is considering, which outputs new considerations, as well as new connections between considerations. When a brain can't handle incoming information to consider how it, and its own consideration structure can both be True, then parts of the brain's consideration structure will progressively evaluate as False against the incoming information that is considering through the brain, and loss of consideration, caused by the absence of dopamine, will cause the brain to atrophy. The brain region that suffers loss corresponds to where the dopamine-deficiency is first or most affecting the brain, and relates to specific information that the brain is trying to handle. Since teenagers' brains are experiencing a higher workload than average, they therefore require more dopamine than average to handle that workload. The strain on their dopamine availability is why teenagers are so susceptible to mental stress-related ailments, which are all dopamine-deficiency ailments. Cocaine, "smart drugs", - anything that notably increases dopamine counters this effect, but increasing adrenaline / noradrenaline agitates stress-states, and undermines a dopamine increase's ability to resolve stress-states. The lack of dopamine is mental stress, and the presence of dopamine is the absence of mental stress, and so fully prevents ailments that enter through the door of mental stress, and branch out from there, from appearing in the first place. It should be understood that where there is visible signs of brain reduction coinciding with dopaminergic drug-use, the brain reduction is not from the dopaminergism of the drug used, or from being a drug-user, but is caused by the stresses in the person's life that led to the situation where dopaminergic drug-use became an important and positive need for them. And the very biggest root-cause of stress surrounding dopaminergic drug-use, from which a plethora of compounding stresses stem, is drug prohibition, propelled by the sociopathic dogma of institutional medicine. The harms of drug-use stem from institutional medicine's stigmatization of the truth. Can you imagine how ludicrous it would be if there was an institution and regulation built up around finding out why starving people have low energy, are emaciated, why they have low general health, why the succeed and earn less than non-emaciated people, why they are prone to bad tempers, and why starving people constantly claim to be in pain that isn't substantiated by the observations of the well-fattened practitioners who treat them (and so isn't taken seriously by them)? And if each expression of their starvation was regarded by institutional medicine as if it were a separate field and independent subject, unrelated to all the rest, with its own terms describing its details, and billions of dollars spent and earned yearly figuring out which patented medication best treats the bad moods caused by starvation, or what non food-based patented medication takes away the feeling of pain from the starvation, while doing nothing to address the root cause of the starvation. And if there were treatment centres set up to convince starving people to cope and deal with the state of being starving, of accepting a compromised life, while still going to through the motions of working a job, being social (even though "social" doesn't exist in a brain that is lacking in dopamine-availability) - people basically being turned into puppets on sticks, doing what they're told only because they literally don't know better, because their brains lack the dopamine to connect the considerations to know better. And if there was, at the time time, an extreme coordinated effort between institutional medicine, government, and law enforcement, to make sure that people were specifically unable to access food? That is exactly the situation that exists today, regarding dopamine-deficiency. The doctors and scientists who carry out this charade are frauds and charlatans, and they, along with the pharmaceutical companies who either know to some extent that they're doing this, or otherwise don't know anything about what they're doing at all, are all guilty of the one of the greatest of all crimes against humanity. Their diagnosis is like practicing the four humours, and their medications that quell symptoms while avoiding the root cause are like chemical lobotomies. Anything that is not to address the symptoms of dopamine-deficiency ailments, but that does not address the root cause of dopamine-deficiency ailments, which is the lack of dopamine, is not treating the ailment, but is instead treating institutional medicine's sociopathic ideology, and the dopamine-plentiful people who practice it, whose conformity to what is False is responsible for the liquidation the health, lives, comforts, of those who are suffering, and who medicine is supposed to be there to serve first and foremost. Instead, those people have been turned into livestock. So, if there was to be a question of 'Where were you when the root causes of ADHD, depression, anxiety, psychosis, schizophrenia, PTSD, alzheimer's, parkinson's, bi-polar, and much else, became known? ', the answer would be: Right here, reading this blog.